No matter who you are, the first year of parenting is all about survival. I was a bit naive, and in my prenatal naivety I thought that boardgaming would be a great past time for new parents. Boardgames are low effort. They’re quiet. They’re easy to put down and pick up again later. It all seemed to fit the bill. What I didn’t realize was that while this may have all been true, we simply wouldn’t have the energy to even open up a boardgame box, let alone try to figure out rules. We maybe managed one or two games during those first six months, but that was about it. Any free time we had was going to naps, cleaning, and cooking. When you’re up all night, or tending to a child all day, or all evening, or any combination of these things… it doesn’t take long to realize that boardgaming will have to wait. No matter who you are, the first year of parenting is all about survival. You are trying your best to learn about your baby so you can keep them alive and happy, all while trying to survive the process yourself. While I managed a fair bit of reading about games, I did very little playing of them… until after he was two-years-old. Don’t get me wrong. Kids are a gift… but they’re one of those gifts that requires a lot of hard work. Even well behaved kids (like ours) are energy draining. I take my hat off to parents with kids who have problems. Problems sleeping, problems eating… or just behavioural problems. Most of these “baby problems” will sort themselves out and go away over time. They’re brief struggles but at the time they feel like they last forever. Regardless, you’ll either figure out how to rectify them, or they’ll work themselves out… but guess what you won’t be doing while this is all happening? That’s right. I need to preface all this by admitting that we’re old parents. We had our baby at 39. That’s ancient in the land of the mamma’s and the papa’s. While I truly think there’s a benefit to having kids when you’re older, there’s certainly other benefits to having them when you’re younger – not least of which is the added energy young people have. Regardless of whether you have your kids when you’re younger or when you’re older, the truth of the matter is you won’t be doing much boardgaming for the first year unless you’re full of vim, crafty with your time, and have very understanding gamer friends. I think our son was just over a year old when we finally felt comfortable enough to have people over for a game night again… but even now, those game nights are rare. A few parents I’ve talked to explained to me that they continued gaming more or less like normal after their baby was born. How? Often times they’ll play after he goes to sleep. For us, this sometimes works (more successfully with naps on the weekend) but on weeknights, when he goes to sleep, we crash mentally and physically. Many parents have family or friends that can look after baby for an afternoon. We don’t have those kind of people nearby. Sometimes only one parent is a gamer, and they’ll work out a way to get out of the house to game while the other parent looks after their child. Since both of us as gamers, this isn’t something I view as practical or fair, but everyone’s situation is different. Gaming can happen anno-babius, but in my talks with other gaming parents, it’s kind of rare during these first few years. 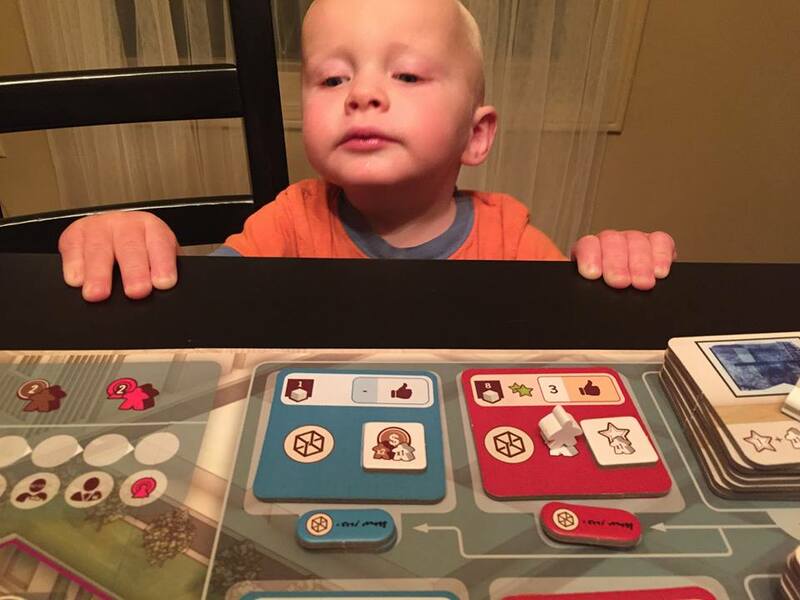 It was roughly around the time our son turned one that I began looking closely at solo gaming. If nobody else could play games with me, I would find some solitaire games that I could set up and play when I had the time and energy. Sometimes these would be quick 30-60 minute affairs, and sometimes they would play over the course of several days. It’s not for everyone, but it absolutely appealed to me during this time in my life, and kept me engaged with the hobby. Great post! I have plenty of angst in this department as well. My kids are 12, 7 and 5, so I’ve made it through a portion of the guantlet. I am a father of a child about the same age, in a one parent gamer house. Its tough, but your points are all correct. Where before I would go weekly to my game night and sometimes have people over on a Saturday afternoon, those days are gone. I am now at 1 game night every 2 weeks (which is up from one a month up until about 1.5 years, and will be down again in May, with the birth of #2, to maybe once a month if Im lucky). I never host anything because its not practical. My son is what I’d call “high energy”, he just goes non stop, which is tiring for us and makes me keep the games away from him still. I fear my board games would become another toy, that he crumples, throws, bites and rips. Being a gamer with a wife who wont came means even more that I can’t wait for my son to be ready to game with me. I have no idea when that will be but, I’d guess somewhere between 2 and 4 years from now. Nice post. My little one is about to turn 2, and while her general routine (she typically sleeps 12-13 hours uninterrupted every night) does allow me (and sometime my partner) some time to game, having the energy to do so at the end of a day is another matter. 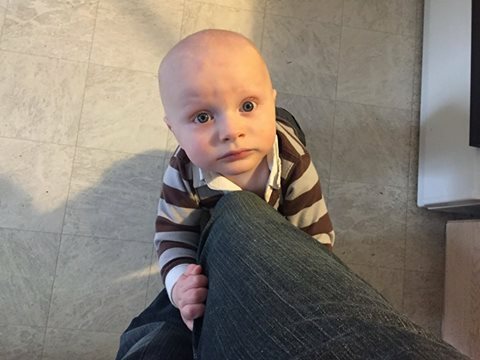 Like you, we’re at the upper end for new parents — I’m 44 and she’s 42 — which doesn’t help none. A bigger consideration for me is the fact that over the past 6-12 months, my usual gaming group has levelled up into very heavy Euros, economic games, and 18xx. We’re all in full froth for the likes of Arkwright, Trickerion, Splotter and Lacerda, 1846, 18AL and 1889. And while the others have the time to devote 5-8 hour gaming sessions to these types of games on a weekly basis, I struggle with it. When I can make such a session, they’ve played the current title de jour 2-3 times since I last made it to the table, meaning their depth of strategic thought is way deeper than mine. So I’m frustrated when I can’t play, and always being well behind on the learning curve means I often am when I can play, too. Alla that said though, it all fails in comparison my daughter yelling “Daddy!” when she first sees me when I pick her up from daycare of an afternoon, and drop what she’s doing to rush excitedly in for a hug. Here’s hoping she feels this way about train games in about … er, 14-15 years time. > Since the birth of my two and a half year-old son.